His Beatitude Metropolitan Sawa of Warsaw and All Poland has addressed His All-Holiness Ecumenical Patriarch Bartholomew of Constantinople to convene a synaxis of the primates of the Orthodox Churches to discuss the Ukrainian Church question, reports the site of the Ukrainian Orthodox Church, with reference to the Greek portal orthodoxia.info. Referring to exclusive sources, the portal reports that Met. Sawa noted in his letter that the situation in Ukraine is worsening every day and needs to be discussed on a pan-Orthodox level. He does not speak about the topic of autocephaly in the letter, but only emphasizes the need for a meeting of the primates with view to a broad discussion of the ecclesial question in the region. The Russian Church has stated that it cannot take the initiative to convene a pan-Orthodox synaxis, but it can initiate a dialogue, and His Holiness Patriarch Kirill of Moscow and All Russia recently wrote letters to all the primates of the Orthodox Churches on the Ukrainian situation. Late last month, Met. 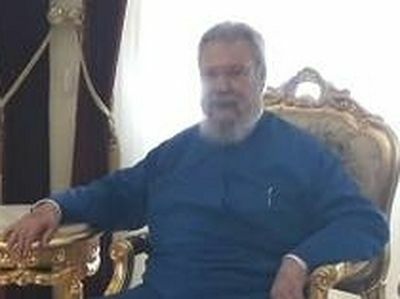 Sawa released a joint statement with His Beatitude Patriarch Theodoros II of Alexandria and All Africa who was visiting Poland, in which the two primates called for the relevant authorities to do whatever necessary to ensure peace in Ukraine over the issue of the possibility of creating a united autocephalous Church. Pat. Theodoros then traveled to Ukraine for the support and consolation of the faithful of the canonical Ukrainian Church, where he encouraged the hierarchs, clergy, and flock to remain faithful to the canonical Church and pledged to inform all the primates of the Local Orthodox Churches about the truth of the crisis situation in Ukraine created by the Ecumenical Patriarchate’s acceptance of the government’s and schismatics’ appeal for autocephaly and his uncanonical incursion into the Ukrainian Church’s territory by sending two exarch bishops. His Holiness Patriarch Irinej of Serbia also earlier sent a letter to Pat. Bartholomew, also pointing to the negative consequences for all Orthodox that could come from the situation in Ukraine. He also called on Constantinople to open a dialogue with Moscow to resolve the issue, as has the Holy Synod of the Georgian Orthodox Church. Pat. Kirill traveled to Constantinople on August 31 to speak with Pat. Bartholomew on the Ukrainian issue. During the course of the meeting, he proposed to hold a meeting of scholars and hierarchs at which it would be possible to discuss the historical documents concerning the question of the Kiev Metropolis’ inclusion into the Moscow Patriarchate in 1686. 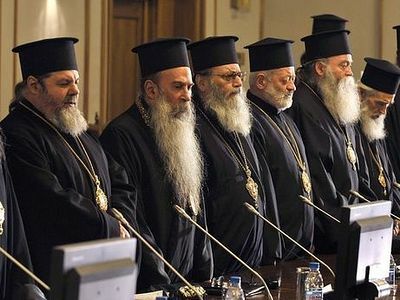 However, as subsequent events demonstrate, the Ecumenical Patriarch refused this dialogue. 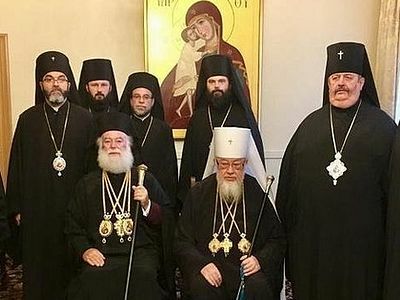 The primates of the Alexandrian and Polish Orthodox Churches have released a joint statement, calling for the relevant authorities to do whatever necessary to ensure peace in Ukraine over the issue of the possibility of creating a united autocephalous Church.